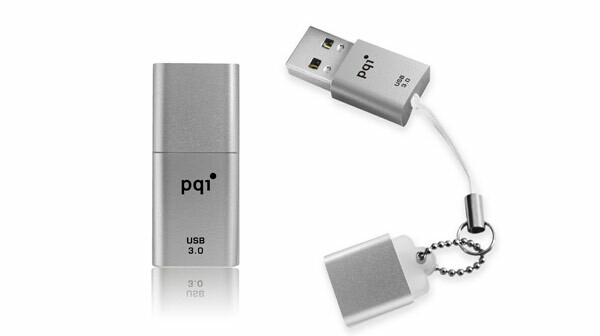 Power Quotient International, otherwise known as PQI, claims to have developed the smallest USB 3.0 flash drive yet. It weighs in at only 3.6 grams, and only 3 cm in length. While there are many smaller USB 2.0 thumb drives available, it is very possible that the PQI Intelligent Drive U819V actually is the tiniest in the faster 3.0 variety. Up until now there have been several difficulties in cramming the speed and memory capacities of a 3.0 USB drive into a more petite housing, and that is why 3.0 drives are typically larger than their 2.0 counterparts. High frequencies and overheating have both been huge obstacles in reducing the size of a 3.0 drive, but PQI has apparently put enough brain power into the concept to pull it off. There are several varieties of USB 2.0 flash drives that are smaller than the PQI USB 3.0 drive (Artic Cool offers one), but they simply don’t compare in either storage or transfer rates. Generally speaking, a 3.0 USB drive clocks in at around 5 Gbps/sec as opposed to 480 Mbps/sec with a 2.0. The U819V is a snazzy looking little creation that comes in both metallic ivory and midnight black. It has a rubber cap attached to the top which affixes the device to a cell phone. And, with the miniature dimensions of this drive, that is a good thing. While smaller seems to be better, smaller also means that a person’s valuable data can be lost in an instant. It could easily become buried under mountains of paperwork or thrown in the recycling with the old newspaper. It is true that USB 3.0 drives are bulkier than what we are accustomed to after having used USB 2.0 as a standard for some time. It is also true that we have to be careful of the amount of weight that we put into our USB ports in order to protect their longevity. However, one has to question if developing smaller hardware has an authentic purpose other than catchy marketing. The PQI Intelligent Drive U819V is available in 4GB, 8GB, 16GB and 32GB. No word yet on the exact date it will hit store shelves. Do you think smaller is better in terms of USB flash drives? Lightweight PQI USB 3.0 Cool Drive: Is It Fast Enough? This entry was posted in Articles, PQI, PQI Intelligent Drive U819V, Smallest USB 3.0 Flash Drive, SuperSpeed USB 3.0, USB 3.0, USB 3.0 Flash Drives and tagged Power Quotient International, PQI Intelligent Drive U819v, PQI Intelligent Drive U819V USB 3.0 Drive, PQI Smallest USB 3.0 Drive, PQI Smallest USB 3.0 Drive U819V, PQI USB 3.0, smaller USB 2.0 thumb drives, Smallest USB 3.0 Flash Drive, U819V, U819V flash drive, USB 2.0 flash drives, USB 3.0 Flash Drives. Bookmark the permalink.